Playgrounds serve to be a microcosm of the world where our kids learn important lessons. They are filled with students who are human. Perfection may not be possible but the aspiration to create a peaceful playground is paramount. We want our future generation to accept that everyone is invited to the party and we all need to learn to co-exist peacefully to create a better reality. A playground is a relatively small fishbowl and a good place to learn about kindness, acceptance, tolerance and to develop problem-solving skills. The Peaceful Playgrounds Program is another program that I really like. Basic messages are framed in a way for kids to easily remember and apply on the playground. 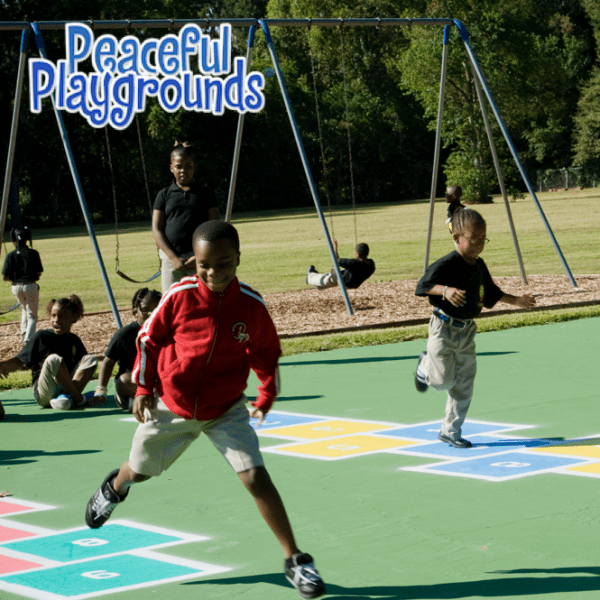 It also includes a plethora of ideas of things to keep kids active and problem-solving on the playground. Problem-solving strategies that you probably remember from your own childhood. Rock, Papers, Scissors ( Yes, you commit on 3 – agreed upon rule! ) In several of my other schools, this was known as Ching, Chang, Push, apparently a well-established strategy in China too!